Sarita Turner is ISC’s Director of Inclusive Communities. In this role, she oversees ISC’s Partnership for Resilient Communities and strengthens the equity and inclusion components of ISC’s U.S.-based clean energy, resilience, and sustainability programming. She is also a key advisor to ISC’s leadership on advancing equity and inclusion through all of ISC’s programs, internal systems and practices. Sarita has deep experience working with community-based organizations, city government, and a broad array of institutional partners to advance equitable solutions to the barriers and challenges facing many communities. 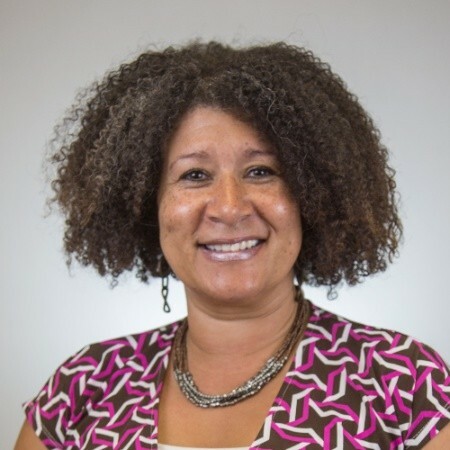 Prior to coming to ISC, she spent over seven years in various roles at Oakland-based PolicyLink, where she worked throughout the U.S. to advance data-driven, inclusive community and economic development practices, and also to advance equity focused policies to improve access to economic opportunity. While at PolicyLink, she managed the organization’s work in the U.S. Department of Housing and Urban Development’s $200 million Sustainable Communities Initiative. Prior to her work with PolicyLink, Sarita served as executive director of the Minneapolis-based West Broadway Business and Area Coalition, which provides local businesses in the West Broadway Corridor of Minneapolis with technical assistance, business support, and capital improvement resources. While at the coalition, she raised funds for her concept of a community farmers’ market to provide access to fresh healthy food for the West Broadway community, which is considered a food desert. A nationally-recognized trainer and speaker on diversity, equity and inclusion, and implicit bias, Sarita sits on the board of the Grounded Solutions Network, which works to connect local affordable housing organizations with national experts to advance affordable housing solutions.